In the event that you urgently need some cash, an instant loan could be the right option for you. If you have found yourself with emergency expenses and need fast cash, instant loans can be very useful to get you through this hard time. The nature of instant loans? Commonly with an instant loan, you can borrow up to $2,000 at a time. You can instantly get the cash after a quick application process. You can make your loan repayments through a pay check deduction or direct debit. Be mindful that repayments must be done within a short amount of time as default fee will apply. Your repayments will include the principal plus 20% of the principal amount, as well as 4% of principal for monthly repayments. Use the Instant Loan Calculator to find out how much you can afford to borrow. Lenders access how responsible you are with finances and only approve borrowers who can make the loan repayments. An instant loan can be a great idea if you have urgent needs is not for long term use. There are many other credit options to consider in that instance. Late fees and charges — Expect to be charged with late or missed payments until you repay the full amount. Make sure to check the different default fees and charges with each lender beforehand. Monthly fee — The 4% of the amount borrowed, serving as a monthly account-keeping fee, is imposed by the government. This makes the monthly fees the same with every credit provider. As a responsible borrower, it is still better to check with your chosen lender early on. Establishment fee — Some lenders will charge you an establishment fee, or one-off upfront fee, to cover the cost of setting up your loan. An establishment fee is usually 20% of the amount borrowed. Minimum loan amount — Before accepting a loan, consider the amount of money you need. Most lenders set a fixed amount that you can borrow. Be mindful of the minimum loan amount, as you would prefer not to acquire more cash than you require, hence pay more in fees. Flexibility with repayment — Look for lenders which provide flexibility in terms of repayments, which is a good feature in instant loans. Most consumers apply for instant loans to manage their expenses. 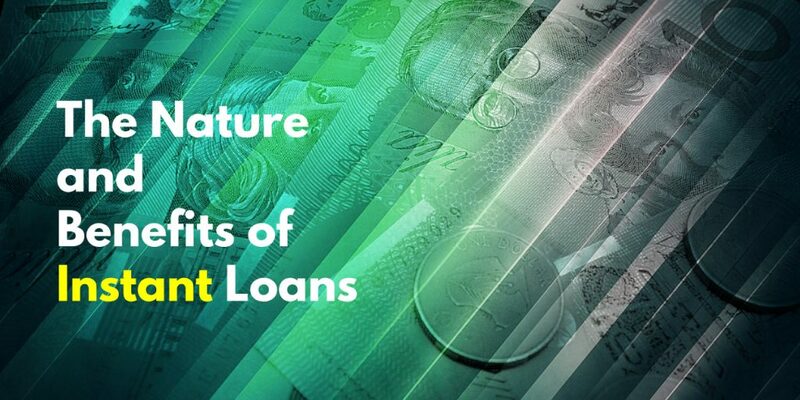 The following advantages will help in understanding why instant loans have successfully helped people tide over their financial problems. Quick cash — The name says it all, the main advantage of an instant loan is the short amount of time it takes to get the money you need. Most transactions take less than 30 minutes to complete. This gives the borrower a feasible option for fast access to funds, after a quick application process. Flexible repayment options — Borrowers must be aware that most lenders offer instant loans with different options for repayment. It reduces the equated monthly installment (EMI) and minimises chances of default. Repayment options can be in the form of direct debit or through payroll deduction. No interest — Instant loans do not attract interest because of the short time it takes to make the loan repayments. In Australia, there is a No Interest Loan Scheme (NILS) which provides affordable credit to people on low incomes. Loan fee limit — The Australian government has imposed loan fee limit to this kind of loans to protect the borrowers. There are varying fees and charges for instant loans and it helps to do thorough research on credit providers. Take a look at the fees and rates you will be charged to know if it will be manageable on your budget. How to apply for an instant loan? ✔ Proof that your source of income is stable for those with bad credit. Note: Meeting the criteria for eligibility and submitting the requirements do not guarantee a loan approval.